One of the hottest topics in the land of being frugal is cutting the cord on your cable television subscription. The average cable TV customer paid $83 a month in 2011 and that number has risen to $123 a month today. That is before you even talk about the cost of Intenet added on (which is averaging $38 a month). The problem is we all love our television so cutting out all the content available on cable is really hard for people and most of us are a little averse to getting rid of the TV all together and watching on a laptop (and that wouldn’t get you a lot of the content anyway). 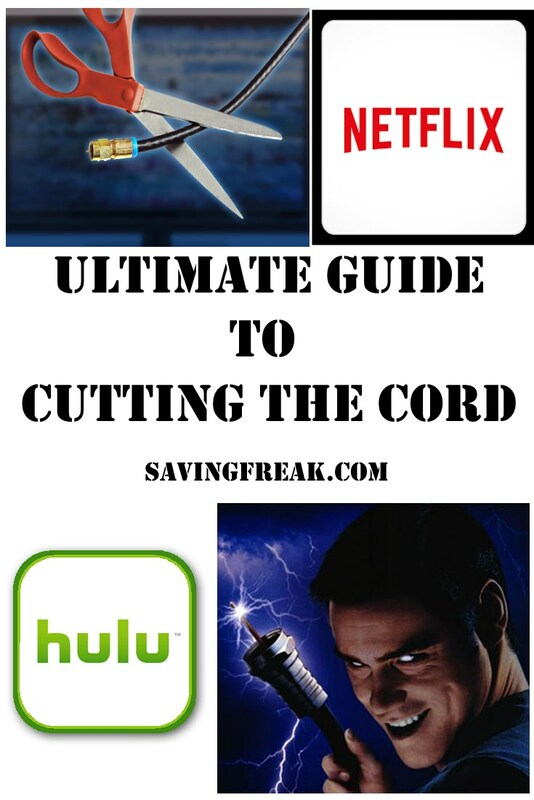 With that in mind I put together the SavingFreak’s ultimate guide to cutting the cord. Of course when you talk about going without a television provider how much equipment you need will depend just how far down the rabbit hole you want to go. This section will cover what I consider the basics. If you are going to pick up the local broadcast channels (ABC, NBC, CBS, CW, etc.) then you will need an antennae. The problem is know which antennae to choose. The good news is that you can see how far away and which direction the television broadcast towers are by heading over to Antennaes Direct transmitter locator. People who live in urban areas are going to pick up a lot more channels than those of us who live a little more country or small town lifestyle. Also, city folk are going to be able to purchase a less expensive antennae that will cost $30 or less like this one, while the more rural will need something with a little more power and cost closer to $100 like this one. All of this will depend on how far away the tower is. I needed a $99 antennae because the ABC affiliate for my area is almost exactly 65 miles away. There are a ton on Amazon at really good prices. With or without the antennae you are going to want a streaming device to open up the world of all the content that is available through the streaming devices. Plus several of my favorite content providers are only available through streaming. You can choose to use a computer but these little devices make life so much easier. Currently the most popular of the streaming media devices is the Roku and Apple TV. They both connect to a myriad of different content providers. I am not going to leave you hanging with just those two because there are a bunch out there that can really open up your content choices. In a few day I will publish a full out review of the top streaming devices and give you a breakdown of features and pricing. When it’s up this section of the post will be replaced and I will link it for everyone to get a full out understanding of over five different great options. Assuming you aren’t going to try and catch your shows when they are actually airing (who does that anymore? ), You are going to need streaming services that will sync with your streaming device. I am going to put these in order of what I consider best bang for your buck. Netflix is the grandaddy of them all when it comes to streaming content. The trailblazer of Internet streaming has changed the name of the game. With Netflix you have hundreds of movies at your fingertips as well as old seasons of television shows that are now out on DVD. Finally, Netflix is now making content available that is only on Netflix. With a long term agreement with Marvel to produce lesser known super hero shows and other great content showing up all the time Netflix is probably a service you already have and, if you don’t have it, a must add when cutting the cord. Hulu almost went out of business, but seems to be pushing strong now with the surge in cord cutting. They have agreements to stream content from NBC, ABC, Fox, and CW one day after it airs. They also have a ton of old television shows and are now getting into movies. Like Netflix they are now getting into producing their own content and will be a player in the streaming market going forward. Amazon is never going to be left out of a market and their Amazon Prime service with streaming video is not an exception. They focus mainly on movies but have great content. The other main advantage to an Amazon Prime membership are that you get free two day shipping no matter how much your purchase is. Amazon is adding more and more to what you get as a prime member. Right now you can stream music for free on certain albums, get a free book each month to your kindle that would normally cost you $8, unlimited photo storage on Amazon Cloud, and 5% cash back if you use an Amazon store card for purchases. So you get a lot more than just streaming video, but for cutting the cord that is the service we focus on. CBS All-Access had to be the annoying one and launch their own streaming service instead of going through Hulu. There are a few shows I watch on CBS but am considering dumping them just on a matter of principle. I will say it comes with some nice features that include streaming live tv for sporting events. So if you want the features it adds it is not a terrible option, but not playing nice with Hulu makes me want to ignore them. So SlingTV is the first time I have thought I can finally get my pay TV content for a reasonable price. The basic package is $20 a month and includes two ESPN channels.There are ten additional packages that you can add and they cost $5 per month extra. My favorite would be the sports package which gives you nine additional sports channels including four more ESPN channels. SlingTV is owned by Dish Network who has brilliantly decided to get into streaming and has the back end in place to make this a success. Live sports is the bane of my existence when it comes to cutting the cord. Why? Because ESPN hates us, that is why. Apparently the execs at Disney (owner of ESPN) do not see a need to work with people on a one off ESPN service. It feels like an attempt to rope all the diehard sports fans into cable or satellite service. This is the whole reason that Sling TV is in the above list. Disney has decided to work with Sling and offer many of the ABC family of channels through their streaming service. So if sports is your main point of concern then Sling TV with the sports package added on is your best bet. I haven’t purchased any additional equipment myself but there is one item that I am seriously looking at and that is a DVR. Why might you want to purchase a DVR? Well if you get a DVR in place then you can eliminate some of the monthly services that are getting you content from local service providers. In the long run this will save you money. Having a DVR also means you can record local news and sporting events that you will not get with Hulu and other content providers. As far as a recommendation I have been doing my research and at the top of my list right now is Tablo. I like the Tablio for two main reasons. The first is that after you purchase the box you can pay a life time subscription fee of $150. This means no ongoing subscriptions, which is why I like it better than the Tivo. Second, it doesn’t actually connect to your television. Instead it connects to any streaming device on your home network. So you can watch the content from any tv in the house that has a streaming device or on a computer. Pretty awesome. Where I don’t like the Tablo is price. The two tuner box is $200 and the four tuner box is $270. You also have to purchase an external hard drive because the Tablo does not have its own storate. The one I like is 1 TB and goes for $55 right now. That will make you think long and hard about the Tivo that is $50 with a $15 subscription. That works out to $405 and that is why I consider this alternative equipment because if you are just testing the waters I don’t recommend starting with this setup. The good news is once you have this in place you are set with no additional costs. I am going to work off the assumption that you have three televisions in your home because that is the average in the United States since 2012. Aslo I am going to assume you buy the Roku streaming stick for two televisions and the nicer Roku 3 for your best television. That works out to $291 that you have to pay once and only pay more if the Roku devices get too outdated. My first Roku box lasted seven years so don’t feel like this is likely to happen quickly. To give you the big picture I am going to assume we subscribe to all the main services and add the sports package to SlingTV. If you but other one off services beside CBS then this number will obviously go up. All that works out to subscription services of $674.64 per year. If we are looking at just first year savings we take cost of cable for the year ($123 x 12 = $1476) and subtract the cost of our subscription services and the one time equipment (291 + $674.64 = $965.64). So your total savings for the first year is $510.36. Not bad when you consider equipment costs. This means that your ongoing savings will be $801.36/year or $66.78 a month. This means you are paying less than half of what you would if you stay on cable tv service. This also assumes you need SlingTV. If you are not going to miss the shows and sports you get from that service you could cut your bill an additional $25 a month. This means you only pay $31.22 a month for your viewing pleasure. So you can no longer as the question of how to get rid of cable tv, but why haven’t you started yet? No matter which way you go it seems like Cable TV is definitely in decline and more an more people will be making this switch. If you have cut the cord or are considering cutting the cord let us know what you think about the idea in the comments or hit me up on twitter @SavingFreak.